Aim: The present study was done to evaluate the oral health status of cement factory workers. Materials and Methods: A cross- sectional study was carried out at Sirohi, Rajasthan. A total of 90 study subjects were included. They were all males who were in the age group of 20-58 years and are permanent employees of the cement factory. For recording the oral hygiene status and dental caries status, The Oral Hygiene Index Simplified (Greene and Vermillion, 1964) and The DMFT Index (Henry T. Klein, Carrole E. Palmer, Knutson J. W., 1938) are used, respectively. Wasting diseases were also recorded. Chi-square was used to find association of dental caries, oral hygiene status, oral lesions and wasting diseases with age, education, brushing habit, frequency of brushing and tobacco use. P < 0.05 was considered statistically significant. Results: Tooth wear was seen among 50% of the study subjects. Forty percent of the subjects had adverse habit. Significant association of wasting diseases was found with age (P = 0.004), education (P = 0.022) and adverse habit (P = 0.014). Adverse habit was also significantly associated with oral lesions (P = 0.000). Conclusion: Most of the factory workers had dental caries and poor oral hygiene. Fifty percent had tooth wear. So, there is a need of oral health education and motivation for these workers along with oral health care facilities in the premises. In cement industries, chemical hazards are frequently observed as many chemicals and dust are emitted in the environment of the industry. Oral health is a state of being free from chronic mouth and facial pain, oral and throat cancer, oral sores, birth defects such as cleft lip and palate, periodontal (gum) disease, tooth decay and tooth loss, and other diseases and disorders that affect the oral cavity. Risk factors for oral diseases include unhealthy diet, tobacco use, harmful alcohol use and poor oral hygiene (WHO). The maintenance of oral health plays a vital role in improving quality of life. Many agents affect the oral health including environmental and occupational factors. Till date, very few studies have been conducted on the oral health status of cement factory workers. Keeping this in mind, the present study was planned and carried out in a cement factory in Sirohi, Rajasthan, with aims and objectives to assess oral health status and oral treatment needs among cement factory workers. This study was carried out with the following aims and objectives. Aim :To evaluate the oral health status of cement factory workers. Objectives: To assess the dental caries status, oral hygiene status, wasting diseases and oral lesions among the cement factory workers and to assess their relation with age, education, brushing habits and adverse habits among the cement factory workers. The factory is well located in Sirohi, west of Rajasthan. A cross-sectional study was carried out, during the month of October 2012. Ethical approval was taken from the institutional ethical clearance committee. Written permission for carrying out the study was taken from the president (works) of the cement factory, Sirohi, Rajasthan. A well-illuminated room of the Sirohi cement factory's dispensary was used for conducting survey. An ordinary chair with backrest was used for oral health examination using Type III examination. A total of 90 study subjects were included for this survey. They were all males who were in the age group of 20-58 years and are permanent employees of the cement factory. Data regarding their personal information and habits were collected through face-to-face interview by a single examiner and with the help of a recording clerk. Data were analyzed using SPSS version 16.0 software. Chi-square was used to find association of dental caries, oral hygiene status, oral lesions and wasting diseases with age, education, brushing habit, frequency of brushing and tobacco use. P < 0.05 was considered as statistically significant. A cross-sectional study was conducted to assess the oral health status of the cement factory workers. [Table 1] shows the demographic characteristics of the factory workers. There were overall 90 male workers who participated; of them 29 (32.22%) were in the age group of 21-30 years, and 8 (8.89%) were in the >51 years of age group. Among these factory workers, 23 (25.56%) were graduates and 5 (5.56%) completed senior secondary. Total 78 (86.67%) cleaned their teeth with toothbrush and toothpaste and 5 (5.56%) used toothpowder to clean their teeth. All of them rinsed their mouth after taking meal. Thirty-three (36.67%) cleaned their teeth twice in a day and 57 (63.33%) cleaned only once in a day. It was seen that 36 (40%) were having adverse habits. In the study subjects, 9% had smoking habit and 1.11% had both chewing and smoking habits. Alcohol consumption was observed in 3 (3.33%) factory workers. Consumption of alcohol and tobacco together was also seen in 4 (4.44%) factory workers. [Table 2] shows the association of dental caries status, oral hygiene status, oral lesions and wasting diseases with age. Significant association was seen between different age groups and wasting diseases (χ2 = 23.976, P = 0.004, S), whereas no significant association was found among different age groups with dental caries (χ2 = 2.331, P = 0.507, N.S. ), oral hygiene status (χ2 = 8.269, P = 0.219, N.S.) and oral lesions (χ2 = 6.418, P = 0.697, N.S.). [Table 3] shows the association of dental caries status, oral hygiene status, oral lesions and wasting diseases with education level. Significant association was found between education status and wasting diseases of study subjects (χ2 = 27.906, P = 0.022, S), whereas no significant association was seen between education and dental caries status (χ2 = 9.497, P = 0.091, N.S. ), education and oral hygiene status (χ2 = 16.115, P = 0.096, N.S. ), and education and oral lesions (χ2 = 18.237, P = 0.250, N.S.). [Table 4] shows association of dental caries status, oral hygiene status, oral lesions and wasting diseases with brushing habit. No significant association was found between dental caries status and brushing habit (χ2 = 1.053, P = 0.591, N.S. ), oral hygiene status and brushing habit (χ2 = 6.056, P = 0.195, N.S. ), oral lesions and brushing habit (χ2 = 0.644, P = 0.960, N.S), and wasting diseases and brushing habit (χ2 = 8.855, P = 0.183, N.S.). [Table 5] describes the association of dental caries status, oral hygiene status, oral lesions and wasting diseases with adverse habits. Statistically significant association of tobacco use was seen with oral lesion (χ2 = 112.777, P = 0.000, S) and wasting diseases (χ2 = 29.358, P = 0.014, S). The present study was conducted to assess the oral health status of cement factory workers. The study subjects were permanent employees of the cement factory, and all were males. 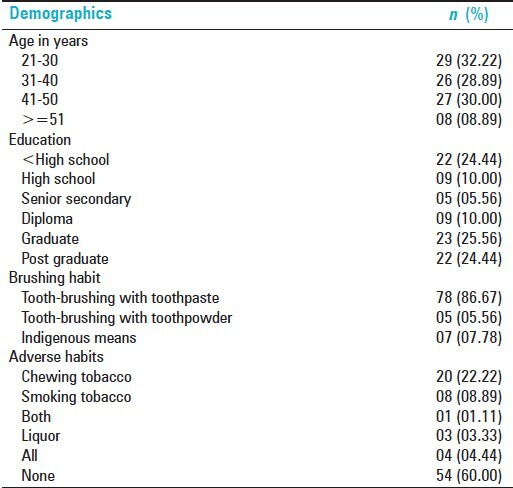 Association of dental caries status, oral hygiene status, oral lesions and wasting diseases with age, education, brushing habit, frequency of brushing and tobacco use was assessed. Various factors such as environmental factors, occupational factors, dietary factors, pathologic factors and oral hygiene practices affect the oral health of an individual. Lack of medical health care facilities in the factory premises, especially oral health care facilities, reflects the factory employees' poor health condition. In this study, 86.67% of workers maintained their oral hygiene by daily using toothbrush. In spite of this, 60% of the study population had shown poor oral hygiene. Chu et al. reported similar results in which despite daily tooth brushing by 88% of the participants, the population had poorer oral hygiene and greater gingival inflammation than other smokeless tobacco-user populations reported in the literature. The poor oral hygiene status could be due to lack of awareness of the proper brushing technique. This shows the need for oral hygiene instructions in order to maintain good oral hygiene. The toxic substance in the plaque becomes a source of gingival irritation, which penetrates the gingival epithelium, causing inflammation of the gingival vasculature and its periphery. Removal of plaque should be the most important objective for the prevention, control and treatment of periodontal disease. In the present study, no association was found between brushing habit and oral hygiene status. This difference in association may be due to the small sample size and memory bias. One of the most striking findings from the study is high prevalence of dental caries (85.55%). The prevalence of high dental caries could be due to the lack of dental care facilities and time. Winn, 2001 reported that high levels of fermentable sugars in the chewing tobacco stimulate the growth of cariogenic bacteria and is a cause of concern for dental caries. This finding of Winn, 2001. can be correlated with the present study where total 36.67% were chewing tobacco and could be one of the reasons for the high prevalence of dental caries seen in these factory workers. 21-30 years). Tobacco consumption in the present study was significantly associated with oral lesions and wasting diseases. Assessing the oral health status of cement factory workers will further aid us in assessing and planning the treatment needs among these workers. Duration of working in the cement factory was also not recorded, which plays an important role in assessing the occupational effects on the oral health. A cross-sectional study conducted in the cement factory concluded that most of the cement factory workers had dental caries and poor oral hygiene. Despite the significant amount of exposure to risk factors, only a few workers presented oral lesions. The presence of abrasive particles (silica dust, asbestos, gypsum, etc.) in the environment plays an important factor for tooth wear, which was observed in 50% of the study population. Significant association of wasting diseases was found with age (P = 0.004), education (P = 0.022) and adverse habit (P = 0.014). Adverse habit was also significantly associated with oral lesions (P = 0.000). After assessing the oral health status of the cement factory workers, it is recommended that a program should be planned, which includes oral health education and motivation, demonstration of correct tooth-brushing technique and educating about the ill-effects of tobacco consumption for cement factory workers. A fully functional dental setup should be established in the factory premises so that workers can avail the facility and treatment whenever and as required. 1. Detels R, Beaglehole R, Lansang MA, Gulliford M. Oxford's textbook of public health. 5 th ed, Vol. 2. The Method of Public Health. Oxford; 2009. p. 894. 2. Park K. Park's Textbook of Preventive and Social Medicine. 21 st ed. Bhanot; 2011. p. 744-6. 3. Sood M, Bhaggana A, Bhaggana V, Sharma N. Occupational dental wear among ceramic factory workers. An Observational Study. J Indian Dent Assoc 2011;5:472-3. 4. Available from: http://www.who.int/topics/oral_health/en/for term Oral Health by WHO [Last accessed on 2013 Mar 06]. 5. Struzak-Wysokiñska M, BoŸyk A, Kamiñska K. Enzymatic tests for alkaline and acid phosphate in gingival tissues in workers of Chelm Cement Plant. Czas Stomatol 1990;43:654-60. 6. Bozyk A, Owezarek B. Incidence of periodontal diseases in workers of the Chelm cement plant exposed to cement dust. Czas Stomatol 1990;43:375-80. 7. Shaikh H, Shankar S, Vinay S. Assessment of periodontal status and treatment needs among beedi factory workers, Haranpanahalli Town, Davangere District, Karnataka. J Indian Acad Dent Spec 2011;2:13-7. 8. Peterson PE, Henmar P. Oral conditions among workers in the Danish granite industry. Scand J Work Environ Health 1988;5:328-31. 9. Tuominen M, Tuominen R. Tooth surface loss and associated factors among factory workers in Finland and Tanzania. Community Dent Health 1992;9:143-50. 10. Peterson PE, Gormsen C. Oral conditions among german battery factory workers. Community Dent Oral Epidemiol 1991;19:104-6. 11. Enbom L, Magnusson T, Wall G. Occlusal wear in miners. Swed Dent J 1986;10:165-70. 12. Chu YH, Tatakis DN, Wee AG. Smokeless tobacco use and periodontal health in a rural male population. J Periodontal 2010;81:848-54. 13. Imaki M, Yoshida Y, Tanada S. Relation between smoking and periodontal disease by oral hygiene status in Japanese factory workers. Appl Human Sci 1997;16:77-81. 14. Winn DM. Tobacco use and oral diseases. J Dent Educ 2001;65:306-12. 15. Tomita NE, Chinellato LE, Lauris JR, Kussano CM, Mendes HJ, Cardosa MT. Oral health of building construction workers: An epidemiological approach. J Appl Oral Sci 2005;13:24-7. 16. Singh GP, Rizvi I, Gupta V, Bains VK. Influence of smokeless tobacco on periodontal health status in local population of north India: A cross-sectional study. Dent Res J (Isfahan) 2011;8:211-20. 17. Rooban T, Vidya K, Joshua E, Rao A, Ranganathan S, Rao UK, et al. Tooth decay in alcohol and tobacco abusers. J Oral Maxillofac Pathol 2011;15:14-21.